Well colour me happy, it's celebration time! 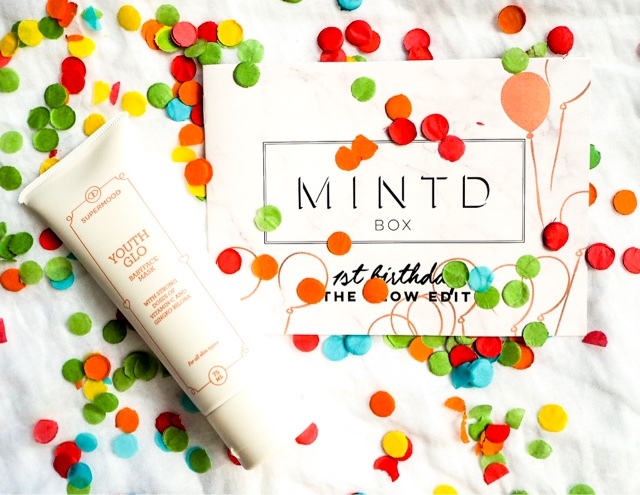 it's MINTD Box 1st Birthday. If you have not heard of them before, don't worry grab a pew my dear friend you still have plenty of time to get to know and love them as much as I do! Waking up and going to bed for the past 8 months since working alongside MINTD Box my skin, hair and nails have never looked and felt so good! I'm bursting with knowledge that I never knew or felt equipped with before, they have introduced me to a vast range of products and brands that are totally new to me and some that I have heard of but not ever tried! Each month is new and tailored to your needs, think of MINTD as your personal Pandora's box, filled with luxury goodies from far and wide at an affordable rate for you to try. 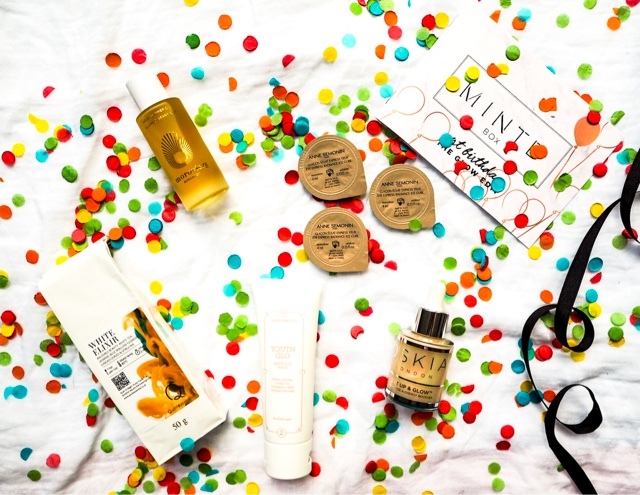 This month's box is all about unleashing your inner glow in time for the summer months and holidays! Helping you maintain your radiant glow throughout the warmer months with products to help revitalise, energise, brighten, refresh and help firm and smooth your skin from the inside out, what more could we ask for. Nothing like starting from the inside out to help boost your inner golden goddess, then with a light refreshing antioxidant boosting superfood charged tea from Quintessential. 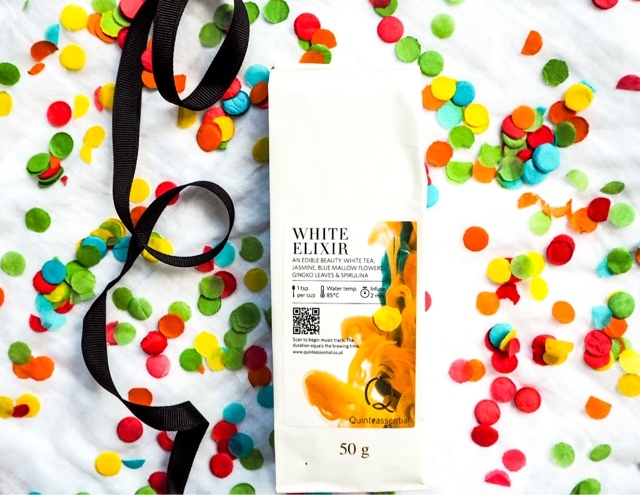 This White Elixir Rejuvenating & Light Tea is designed to combine in your daily routine, helping you to achieve a mindful, healthy lifestyle. Infused with Spirulina Algae, floral notes of Jasmine this tea can be enjoyed hot or cold. Not a tea fan like myself do not worry, I was pleasantly surprised by its taste and aroma and more than happy to enjoy and incorporate into my busy morning routine. With this summer sun beating down on your face, there is nothing quite like a cool down. With Superfood, Youthglo Babyface Mask, you achieve just that. A luxurious mask, designed to clarify the skin and boost collagen production, is perfect and helps to repair sun-damaged skin and signs of ageing all whilst helping to soothe the skin and reduce redness, all whilst smoothing those fine lines and helping to boost skin radiance. The Eye Express Radiance Ice Cubes, from Anne Semonin is enriched with natural active ingredients, such as Gingko Balboa, gourd extract and hyaluronic acid. Perfect for day or night use and super easy to apply and store (in the freezer) it helps reduce and refresh puffy eyes helping maintain the radiance in your skin and fret not, it is perfect for those with sensitive skin. Ok, so I have a favourite so kill me! 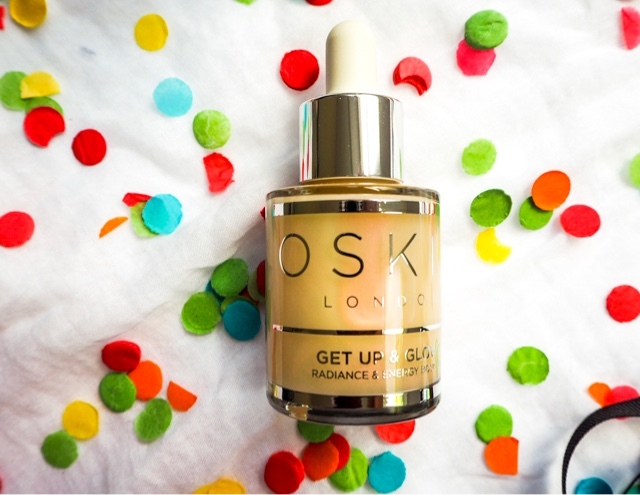 Oskia Skincare is totally new to me, but I love them! I said it yep! my favourite product, Get Up & Glow Radiance & Energy Booster ( A mouthful I know) is pure beauty in a bottle and is immediately apparent as to why it is award-winning 'best skin protector'. This lightweight revitalising and energising serum packs a punch. Designed to actively brighten and firm and even skin tone and helps to improve the appearance of fine lines and protect you against every day and lifestyle damage all whilst leaving your skin youthful and with a radiant glow, for me does just that. I even felt a lift in my mood, and it can be applied before or even after makeup application or if needing that golden goddess glow throughout the day. and is suitable for all skin types, so what can I say! Winner, winner chicken dinner! Or in my case a nice golden nanny's glow! 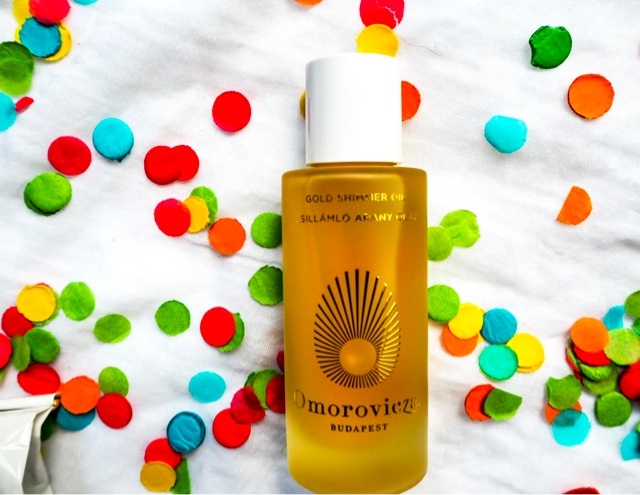 For the summer months, I am all down for a body oil and this Omorovicza is a true beauty, not only does is it give you that sassy golden shimmer from this body oil, but it smells like a summer's dream, beautifully lightly fragmented, scented with Ylang-Ylang and Orange Blossom is perfect for the holiday season and all whilst restoring suppleness, elasticity, toning and strengthening your skin, leaving it super soft to the touch. Verdict! 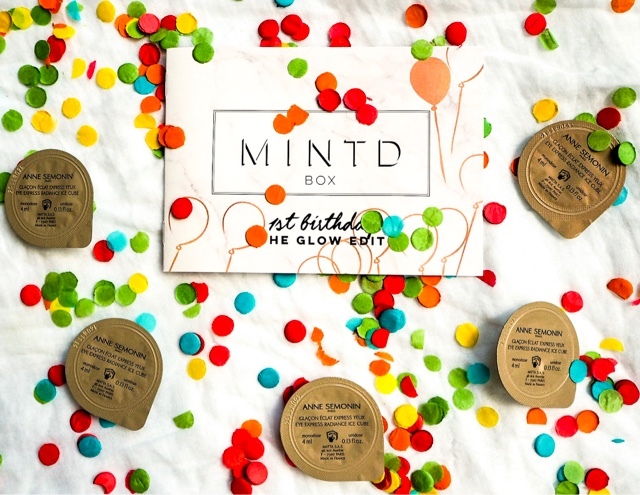 MINTD Box for me is my beauty mecca! The monthly box costing at £65.00 is a steal and I do mean a steal, you are saving a whopping £106.00 what more could you ask for, all that extra mula you are saving can go towards a new bikini or handbag you have been coveting. Another bonus about MINTD is that you can choose a monthly or bi-monthly subscription package to suit you! Well two bonuses in fact, if this is your first box enter promo code WELCOME17 for FREE Worldwide shipping ,after all, it is about YOU! Just knowing that each month you will be educated and be sent a selection of luxury beauty products that you may or may not know is perfect and a real treat. A massive thank you to MINTD and a big fat whopping Happy Birthday! I am looking forward to spending many more with you and helping you celebrate, unfortunately for my postman each month he has to witness a rabid Mumma looking wild out the window insight for my monthly boxes. **This post was created in collaboration with MINTD Box. All thoughts are my own.